GoGo Foundation honored Hari Bahadur Thapa, Chief Editor, Annapurna Post Daily with 'GoGo Foundation Award 2017 recognizing his outstanding and tireless effort for fighting corruption and contributing to improve governance through investigative journalism. The Chief Guest Anup Raj Sharma, felicitated him with the Award. The award carries a purse of NRs 11,111 and a Letter of Commendation and a GoGo Foundation Running Shield. Prof Dr Bhagwan Koirala, a prominent Heart Surgeon and Kulman Ghising, Executive Director, Nepal Electricity Authority were awarded in the year 2015 and 2016 respectively. Receiving the GoGo Award, Mr Thapa, said that the greater responsibility lies on him to live up to expectation of the people. He further added that the responsibility to reduce corruption and ensure good governance is greater than ever before. However, he assured that he will not leave any stone unturned to work for the betterment of society and country in days to come. The Chief Guest of the event, Mr Sharma, said that it is a good initiative by the GoGo Foundation to acknowledge those who work for the well being of the society. 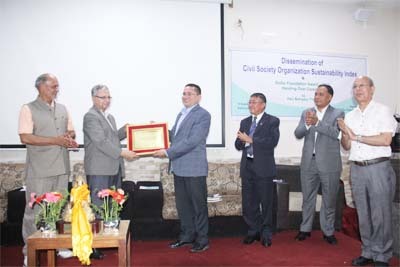 This award will certainly boost the morale of the civil servants, anti-corruption activists and CSO members to work in fighting corruption in Nepal.